It’s a busy restaurant, but the terrace area is only half filled so there’s a laid back relaxed feeling. The musicians gently fill the space (and my thoughts) with their tunes. Nature surrounds us. 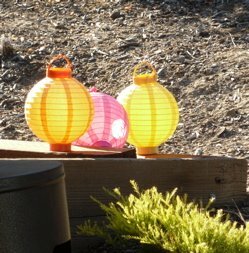 A white-tailed deer wanders up to the edge of the terrace to sniff a wayward paper lantern sitting on the rocks. 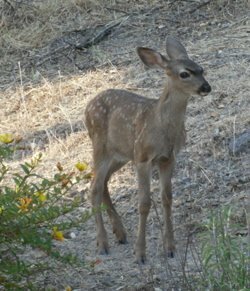 A moment later her fawn, its youthful spots nearly faded, follows her and stares at me long enough to tempt me to take its picture. In my view, romance does NOT require another person. It can easily exist between you and yourself, you and nature, or you and a higher power. Romance with another is just those special moments shared and appreciated together. My date with myself was a beautiful way to wind down on a Thursday night, a loving gift to myself. Romance yourself and draw more sweetness into your life. I didn't wait for my husband to know what I wanted or make him join me (he was playing tennis), but sought out what I enjoy on my own. Not only was it satisfying and pleasurable, but empowering. So many of us WAIT for romance to be delivered to us like a take-out meal. We sit passively waiting and feeling powerless, ignored, and empty. But that is an illusion. Romantic living abounds all around us, it never ends. It’s always there if you look for it. Appreciate nature, really notice the details of the season. Take yourself to lunch at a charming bistro under a flowered trellis. Whether you’re in a relationship or not, stop WAITING for someone else to supply the romance. No more existing with the “pause” button pressed on your life! Treat yourself like the precious gem and unique gift you are to this world. Then drink it all in. That’s how a goddess lives. Have true romance tips to share? We'd love to hear them!